Life love clutter and other beautiful things: You have mail! Don't you just love getting mail?! I do. I skipped all the way back to the office after lunch today. I had just collected some lovely mail at the PO Box. Yay! I love receiving mail. So exciting. It just does not happen very much these days. A lovely letter or card from faraway friends or, like today, a lovely little parcel! I get so excited about opening up a parcel. It is even more of a treat when someone has gone to the trouble to wrap it so sweetly! I love to take my time when unwrapping a parcel. To enjoy the details and savour the moment so to speak. I think this is because I love pretty papers and ribbons and such things. I really love wrapping a little parcel for someone special. I think it makes the joy of giving and receiving so much more special. Don't you? How gorgeous are my little brooches. I was so spoilt by the lovely Rosie. I only ordered one, technically, however generous gorgeous Rosie sent me three! I adore them. I am a bit of a fan as you can tell. I love her range of vintage style brooches and hair clips and slides. I have quite a stash at home and now have these three lovelies to add to my collection. I was drawn to her gorgeous hand made work years ago at a little favourite store of mine. The packaging is divine. I love the creative designs she uses for her beautiful packaging. I am looking forward to some upcoming Christmas markets where she will be. If you don't live where I live then you can order from her online store. Soooo lovely!! You're right, darling, this package is divine and I'd really love to receive something like this!!! I guess it would make my day! I know what you mean about receiving gifts in the mail! It really makes your day! I love receiving mail too! sometimes I do mail swaps with blogging friends. you have such a lovely blog :) maybe we could follow each other! Such a delightful little treasure that you could delight in today. The packaging looked so beautiful I can just imagine how happy you must have been it is such a joy to receive parcels, I love them too. I'm gonna chek on her store! I'm definitely going to check out her store, gorgeous gift ideas! And what a sweet way to make someone's day better- lovely parcels wrapped with care are so joyful! Gee, thanks... I feel all warm and fuzzy inside. It's amazing what some brown paper and string can accomplish! Oh they are adorable! and so beautifully wrapped. You're right, it's so lovely to get something nice in the mail, whether it be a card, letter or parcel. Beats all the bills asking for payment of money!! I like the brooches too. Lovely. I agree, there's nothing better than getting something in the mail, and how cute is that packaging! 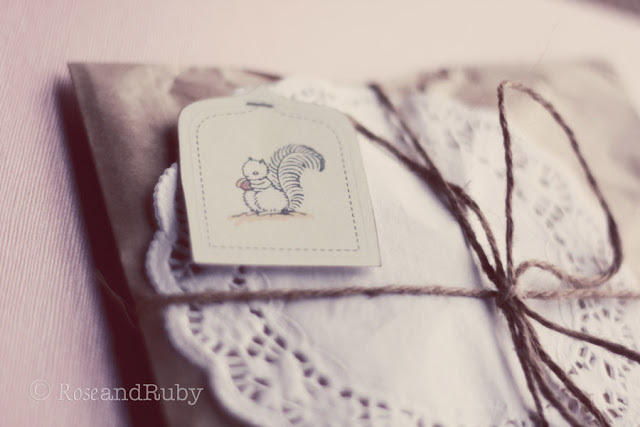 the wrap is almost to beautiful to open ... and those little brooches inside are just so sweet! gorgeous packaging - and such a cute pin!!! i think details to packages is part of the fun!! Such a gorgeous package! Have a sweet day! These brooches are adorable! Love!! And the packaging is soo cute. Awww, what pretty packaging. I DO love pretty wrapping and presentation. There is absoutley nothing like receiving a parcel in mail. This one is so sweet and gorgeous. It is great getting mail; it's even better when the parcel is as lovely as your! Love getting mail as well and I would be smitten to have the joy of opening this piece!! ohh, and what beautiful packaging!! i love it. i want it! Oooh, forgot to say, I'm your newest follower!